Sunward Steel Buildings, Inc. was honored to fabricate and supply this pre-engineered steel building for a client in Summerland, British Columbia, Canada, in August of 2002. 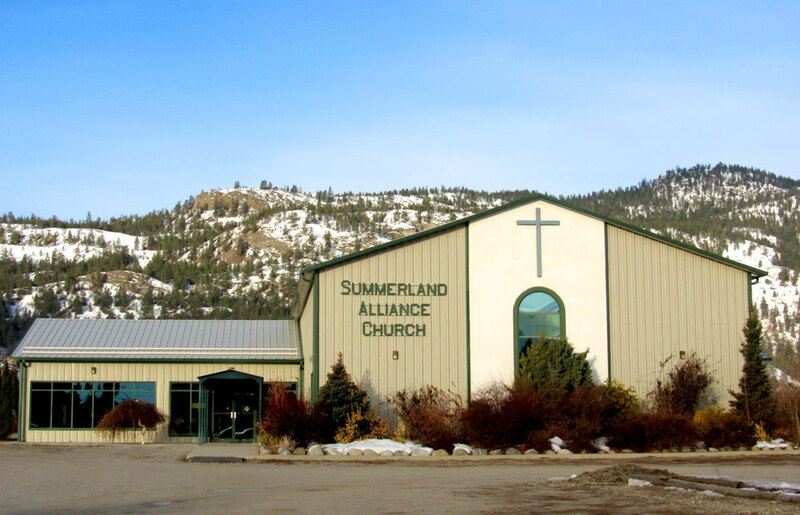 Since then, it has served as the community’s Summerland Alliance Church, which hosts weekly Sunday services and is a member of the Christian Missionary Alliance of Canada. Equal parts attractive and practical, the steel building combines the supreme functionality of a metal building with the aesthetics and accommodations of a traditional church building. Spacious, low-maintenance and designed to last the long haul, the church gives members of the surrounding religious community a safe, secure space to congregate and worship. Offering an attractive, eye-catching exterior, the building is Stone Beige in color, and it boasts a matching Stone Beige roof with a 4:12 pitch as well as complementing Dark Green trim. Once completely erect, the pre-engineered metal church building, which is comprised of top-of-the-line steel components, stands 51’x100’x20’ in size, and it features an open, clear-span design characterized by high ceilings and an obstruction-free interior. Two additional steel buildings are also part of the church campus, and one stands 40’x16’x12’, while the other boasts a finished size of 40’x40’x12’. Additional accommodations include gutters on two sides of all (3) church buildings and (18) 360 LF downspouts that divert moisture away from the roof and the church itself. In addition to serving as the primary headquarters and meeting place of the Summerland Alliance Church congregation, this prefabricated metal church building also offers space for educating students and serving the underprivileged. In addition to hosting kids’ services and youth groups, the church operates God’s Kitchen, which is a gathering place that provides clothing, meals and support for the elderly, poor, lonely and homeless. A popular choice among those seeking economical construction solutions for houses of worship, premanufactured steel buildings retain their strength and beauty over time, needing very little in terms of routine maintenance. This building has served as a central resource for religious residents of Summerland for more than 15 years, and it should continue to bring members of the community together for generations to come. Situated along the west side of Okanagan Lake, the town of Summerland is situated within British Columbia, Canada. The community sits about 425 km outside the city of Vancouver and about 50 km from Kelowna. Considering purchasing a pre-engineered metal building for religious or other use in Canada or another part of North America? Click here for a price quote.